Chris Guse has designed sound and provided technical direction for over 30 productions at the University of Wisconsin-Milwaukee. Recent favorites include sound for "Ruined” and “The Last Days of Judas Iscariot”. Other recent design projects include sound for Lend me a Tenor, October, Before I was Born, Collected Stories, Heroes, Jeeves Intervenes, Duet for One, and sound and video for Master Class and The Detective's Wife with the Milwaukee Chamber Theatre. He designed and created the environment and multimedia content for The Congo Code (a 2015 Milwaukee Business Journal Eureka Award winner) and Trash or Tunes with Kohl’s Wild Theatre. Chris worked with Uprooted/Renaissance Theaterworks creating the sound designs for Neat and Crumbs From the Table of Joy and the video for Shorewood High School’s groundbreaking, 2016 Tommy Award sweeping American Idiot. Chris composed and performed original music in conjunction with sound design for UWM's productions of "Oedipus Rex”, "Mr. Melancholy”, “1001", "Einstein's Dreams" and "From These Green Heights”; the last three yielding specially mixed mastered LP length publications (Digital Download/Compact Disc). Other related work includes assisting R.H. Graham on the scenic design for Milwaukee Ballet's "La Bohéme" and "Peter Pan" and designing and building the mobile sound infrastructure for the Kohl's Wild Theatre. 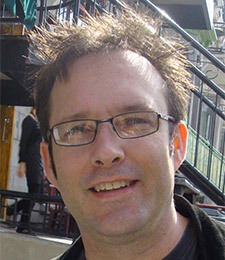 An associate professor at UWM, Chris is a certified online instructor, teaching in the areas of sound design/technology, multimedia arts, computer drafting and technical direction.